This month we are exploring the topic shapes as part of the JAC blog hop. I was all set to bore you to tears with how I see a certain shape, create a whole bunch of different pieces with that shape and then move on to the next. But you know what? I just could not hit the publish button. It didn’t seem complete. There is always a story behind everything and my gut was telling me to hold off, to find the story. One very early example would be my discovery of the use of copper washers to make jewelry. It was liberating to move past bead stringing and chain making, to be able to incorporate more rustic elements into my jewelry. This old post describes how excited I was to find a tool to punch holes into the washers:) I proceeded to add circle shapes to a lot of my jewelry at that time. But soon I was longing for a way to bring a different vision to life. I had recently learned to weave wire, but wasn’t quite sold on all the ornate and overly complicated looking designs I kept coming across. Simplicity coupled with geometry was what I was craving and that is how this earring design came into being. And even though I have recreated this pair of earrings numerous times, I have not tired of them and I doubt that I will. You may have read my recent post about the way I have devised to cut jump rings. With the introduction of the jewelers saw another shape entered my designs – the square. Sawing straight lines is good practice! It started out small, incorporating squares in earrings and as connecting elements in bracelets and necklaces. The purchase of my disc cutter enabled me to finally produce consistently what I had not wanted to even attempt to do with my jewelers saw. Cutting consistent holes many times over and with relative ease. With some trial and error I arrived at this design, a gorgeous pendant that incorporates a bead created by my friend. The bracelets are also a good example of how I love to use my favorite little Fretz riveting hammer for texture. Playing around with my disc cutter resulted in many more design options like this assortment of earrings. 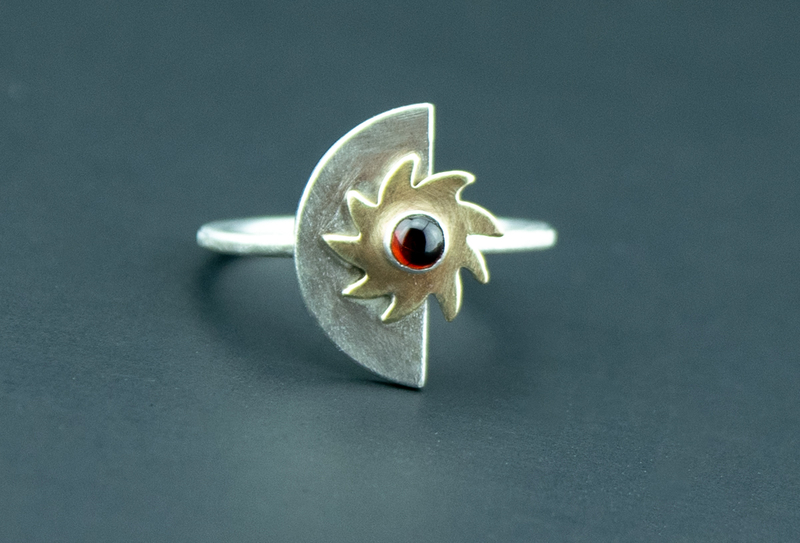 I am currently completely smitten by half moon shapes. And their creation has the added benefit of resulting in little leaf shapes like the ones I included in the silver earrings above. This journey through shapes has been tremendously inspiring to me and keeps nudging me on to walk down the path of creativity. I leave you here with my latest piece. The original plan had been to put a Czech glass bead in the center, but the links remind me of a spine and adding a fossil component made so much sense. What do you think? See you there and happy creating! *disclaimer: all of the links provided are for informational reasons only. I was not compensated in any way for any of the statements made in this post. Karin, what a treat it is to see where your journey through shapes has taken you. The spine bracelet is fantastic and I am looking forward to seeing which shape grabs your attention next! Thank you Dawn! I have to admit, I am pretty proud of the bracelet, especially, because it involved some soldering and I am still nervous about that to say the least! A wonderful post. It has been a delight following your creative journey so far. Thank you Cat! I never really know what’s next and I love that about the creative process. Thank you! The bracelet is really something that evolved from a pair of earrings I made the day before. The earrings came about when the design I had in mind just did not want to work out. It is a convoluted path at times, but the journey getting there can be just as much fun as the destination, right? A disc cutter is one of the tools that are on my list, love all the pieces you made with it. It was one of my best tool purchases so far! There is so much you can do with it, it has opened up a new world of possibilities! I had the chance of buying one really cheap from somebody a few years ago, cashflow was low at that time and I still regret that I couldn’t buy it then. Maybe one day I will buy a set, they range from € 200 to € 600 in my country at the moment. They aren’t cheap, but definitely a worthy investment. I can make so many of my own findings now, like bead caps, so I save money down the line.